To purchase work click here. The Ash Mandrake Act incorporates music, loop machines, stories and comedy. He designed the double necked guitar, hats and costumes. This is folk rock, but many styles are used. He has been described as imaginative; an incredibly skilled musician and songwriter; unique, brave, and completely naturalistic. 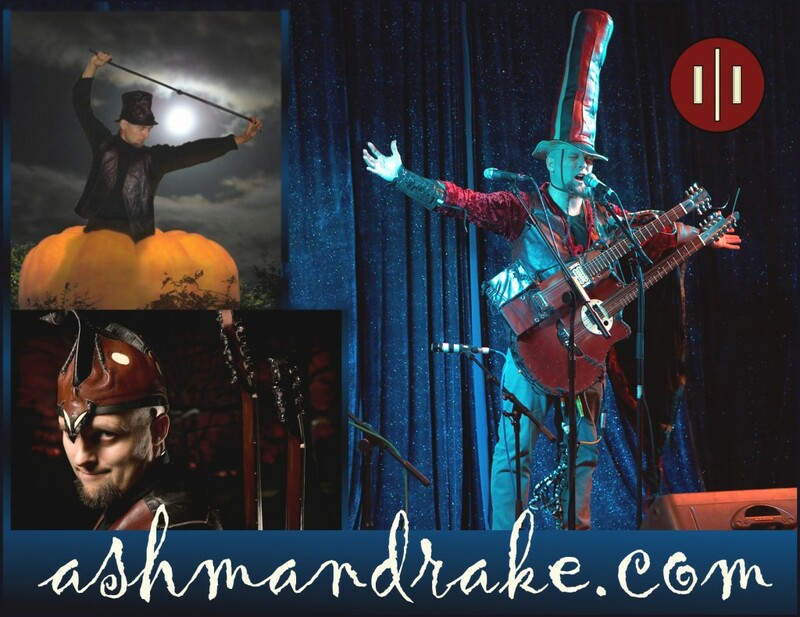 Ash Mandrake Live is about Entertainment. Take a voice like Sting having swallowed an opera singer or Midge Ure crossed with velvet. Now multiply that voice by twenty, using modern loop machines. Throw custom guitars into the mix. Lay upon this the ancient craft of story telling – with spoken delivery that has been compared to Richard Burton and Anthony Hopkins. The next step is to coherently weave a collection of exquisitely hand crafted hats through all that quality. Having difficulty imagining how this might work? Please refer to the opening statement above. I was so impressed I bought three CDs straight off, at times he can sound quite Celtic and has a great voice and vocal range, sometimes so sweet it makes you think of Robert Wyatt. Somebody stole and spliced the DNA of Robin Williamson, Arthur Brown, and Captain Beefheart. there is no other way to describe – or explain – Ash Mandrake. A modern troubadour, complete with hats and travelling van. A good eccentric is hard to find and in a medium where many acts can sound the same, here’s one act that trumps so many in terms of stage presence, image and musical ability. With mutant instruments in his possession, he will take you on a ride that no amount of Frank Zappa will prepare you for! Grasp it tight, it’s Ash Mandrake! …imagine The Mighty Boosh as a one man show, being taken to a time of folklore, rock, dragons and bank managers, but actually being able to sing and play the instruments (and minus Bollo and Naboo). You would then have this great act.